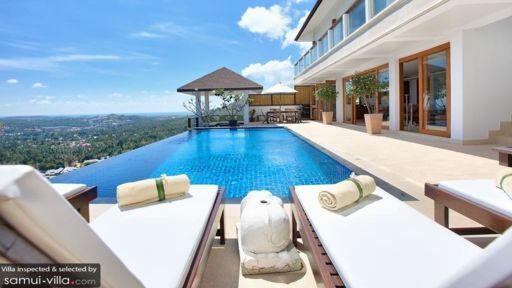 Redefining luxury holiday homes in Samui, Thailand, Villa Ban Lealay is a four-bedroom private villa rental that offers contemporary living in a naturally-abundant setting situated atop Bophut Hills overlooking lush flora and the ocean. With an infinity-edge swimming pool facing a panoramic vista, the villa caters to a variety of needs including amenities such as a fully-equipped gym, pool deck, outdoor sala, and sauna with living and dining space, and an indoor living area for comfort. The bedrooms are equally luxurious offering spectacular views of the natural splendour that is Samui! Upstairs on the main level are three of the four bedrooms at Villa Ban Lealay; two of them are furnished with double beds and one with single beds. The bedrooms are luxurious to say the least with warm, earthy tones, whitewashed walls, and bright artwork on the walls. The best part is the balcony overlooking the scenic beauty of Bophut and sliding glass doors. The air-conditioned bedrooms are spacious and allow for a private moment to yourself where you can enjoy the ambiance and lose yourself in nature. En-suite bathrooms with necessary amenities complete the bedrooms. The master bedroom is located at pool level just off the living area and right opposite the sala. It is furnished with a double bed and sliding glass doors take you directly to the pool deck. There is even a balcony in front with doors that overlook the stunning views. The comfortable space is air-conditioned and accompanied by an en-suite bathroom with a freestanding bathtub set against a glass wall! 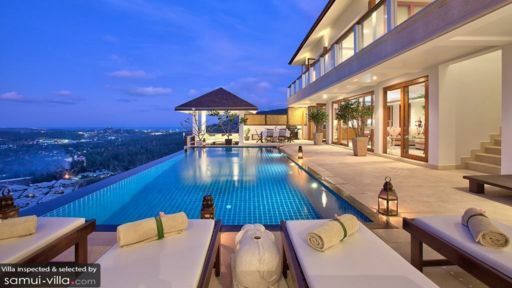 One of the most striking features of the villa is its free-size swimming pool sporting an infinity edge hovering on a hill with sprawling views of the verdant tropical foliage and sparkling ocean in the distance. The vast skies beckon as you lounge on the sunbeds and bask under the tropical sun. There is a traditional sala with comfortable couches and an alfresco dining area on the pool deck for breakfast in the open air or dining under the stars! In the corner, you will find a comfortable daybed for resting and even dozing off in the afternoon. As you enter the villa, you reach the upper level which houses three bedrooms adjoined to a balcony with mesmerizing views of the neighbouring areas. Steps down lead you to the pool and living area at Villa Ban Lealay. 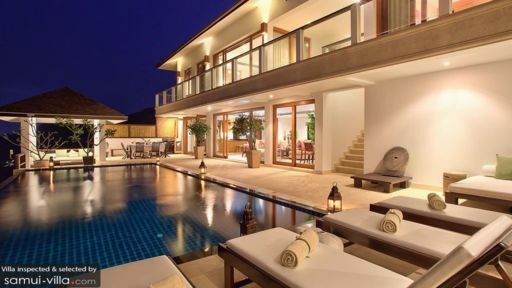 The poolside living area opens to the pool deck along with its flourishing views. The cosy, warm interiors ensure that you have a wonderful time with friends and family while lounging indoors. The beautiful living area is decorated with indoor plants and flowers that brighten up the room even further making it even more cheerful. There is another indoor dining table with wicker chairs for guests if they wish to eat inside. There is a fully-equipped kitchen with modern amenities and appliances at your disposal and you can cook up a storm if you wish! The villa is staffed with housekeepers and even offers personal guest assistance so they can address whatever needs you may have. The staff is highly-professional and warm to make your stay a comfortable one. You will be settled in alright and you can request for massages in-house as there is even a sauna for you to use. Car rentals are available upon request and a personal chef can be called in to delight your palate with delicious offerings! A few minutes away from Bophut beach, the villa is ideally situated and puts you close to many restaurants and fun things to do around Samui. There are restaurants like Namu and Zanzen that you can try out. Head to Fisherman’s Village to explore the local markets and seafood restaurants. Beach clubs and bars are a great way to observe the beautiful sunset so Q Bar and 9Gems Lounge are perfect for some drinks during the evening!